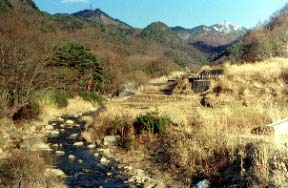 Some Hontani rivers, 2598 m of back Chichibu dominant peaks "Mt. 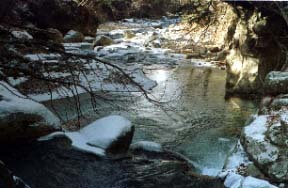 Kimpu", and Ryokan towns are upper streams. 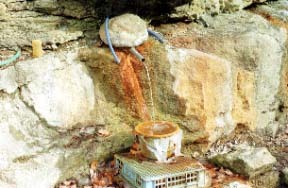 radium content -- there are many the world's No.1, sick medical treatment, Toujis, and people that visit to the rest after mountain climbing. 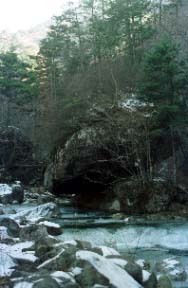 The Hontani-river ravine of water and a huge rock and red leaves which cleared up are called more than Oirase. 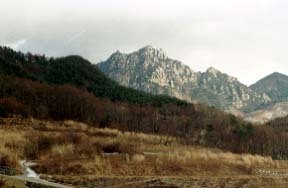 It is counted by the rocky mountain and Mizugaki mountain (2230 m) Japan one hundred famous mountains which were made by eroding the huge rock "Benkei's Chikaraishi" granite of a Hontani-river ravine.